Business owners and executives are just as upbeat about their own organizations. 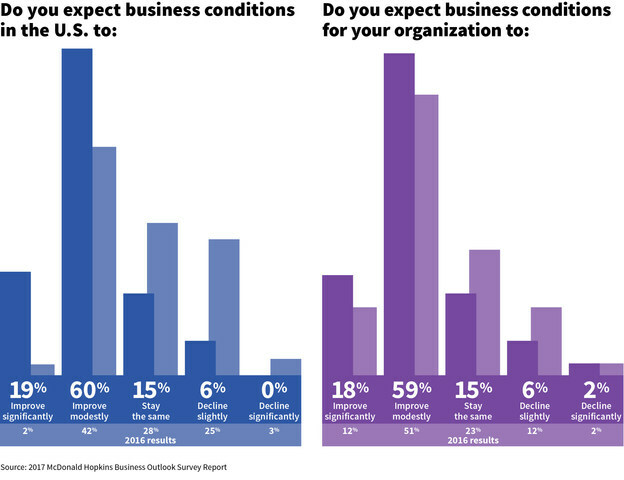 Seventy seven percent expect business conditions to improve at their companies. Thus, 55 percent say they are likely to increase their number of employees this year. However, 50 percent define attracting top talent as a significant business issue. What specifically does the business community expect the Trump administration to do? Seventy eight percent of the respondents believe passage of comprehensive tax reform is important to their company. “Without tax reform across the board, business growth will be limited…” one person commented. Are they optimistic the new administration will achieve comprehensive tax reform? Sixty percent say yes. But less than 50 percent believe the Cabinet-level appointments will facilitate growth for their business. “I expect that business issues will get more attention/support from government due to the new administration, but it’s a barge, not a speed boat,” a respondent noted. From a list of 12 business challenges, the three greatest are: retaining profit margins (41%), federal, state, and local regulations (41%), and stiff competition (40%). Increasing healthcare costs (37%) dropped to fourth place from first place last year. Although data privacy and cybersecurity threats are a big concern for most companies, only 23 percent describe their organization as very prepared. Other topics covered in the survey include preparedness for acts of terrorism, interest rates, capital investment, and dedication of resources to domestic versus international growth. The 2017 Business Outlook Survey was conducted from Jan. 4, 2017 to Jan. 31, 2017. Click here to read the report.